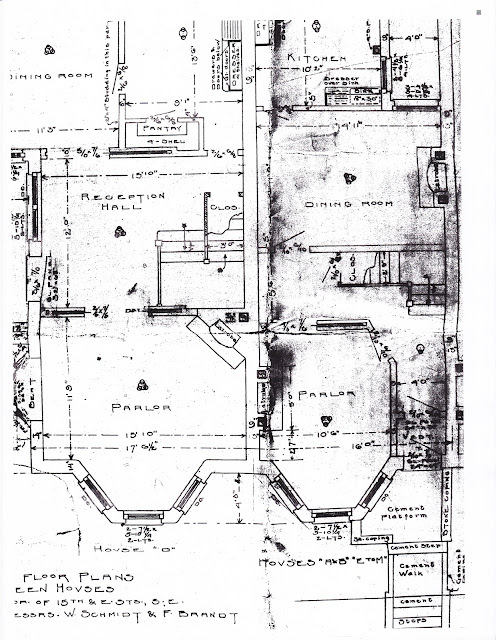 Over the twenty years that I’ve been researching historic houses in Washington, DC, I find that in only about 15% of the cases do we discover the original blueprints have been retained with the building permit: some are the coveted façade drawings, and some are the even more rare floor plans. 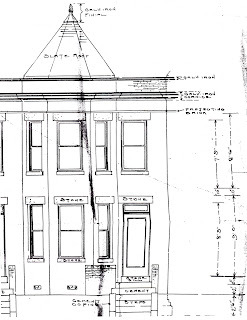 We recently discovered and even more rare occurrence: both façade and floor plans for a client in the 1500 block of E Street, SE. They were thrilled to discover how their first floor had originally appeared. It solved many mysteries for them. 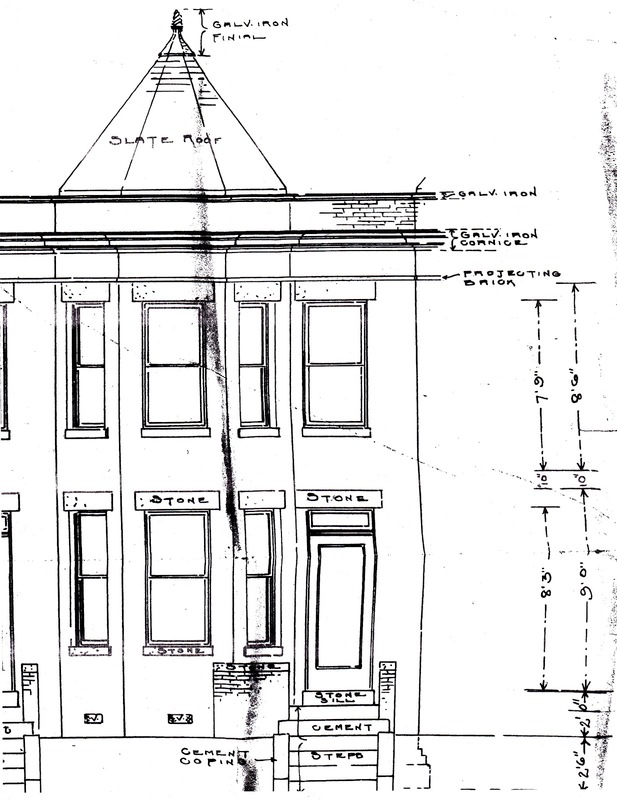 The owners of the vacant lots where 1502 to 1518 E Street, SE were to be constructed, Wilhelm Schmidt and Frederick D. Brandt, received their building permit on May 17, 1906. They listed architect B.Frank Meyers on the application as responsible for their design, and their own construction company, Schmidt & Brandt, as responsible for their erection. They estimated the cost of building all nine houses as $18,000, or approximately $2,000 each. You might recall that we composed a blog entry for grocer Wilhelm Schmidt here, who ran a grocery at the corner of 18th and T Street, NW, today home to Rosemary’s Thyme restaurant. The floor plans revealed that a Latrobe Stove was inserted into both the front parlor and the dining room fireplaces, and that the kitchen featured a coal range, sink with cabinet overhead, and a built in wall cabinet with upper glass doors and lower wood doors and drawers on the party wall. Architect Benjamin Franklin Meyers (1865-1940), known as B. Frank or BF Meyers, contributed many row houses and theaters to the Washington, D.C., area. 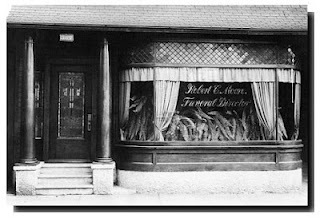 Meyers was born in 1865 in Nazareth, Pennsylvania. He moved with his family to Washington, D.C., as a child and attended school here. He also received his architectural training in Washington, D.C., not through an educational institution, but likely through his father, John Granville Meyers, a local builder and architect. Once and awhile when your researching through thousands and thousands of rather boring vintage photographs looking for a building or house, you come across something like the image above that just makes you stop in your tracks. We included this image in our book Woodley Park in 2003. Here we have a lovely publicity photograph taken at the Sheraton (now Marriott) Wardman Park Hotel pool in the 1960s. It shows Miss Joan Vermett at left, a 20-year-old Miss Washington contestant from Arlington, Virginia (kind of defeats the purpose, eh? ), and Miss Ray Heath, a 20-year-old resident of southeast Washington. 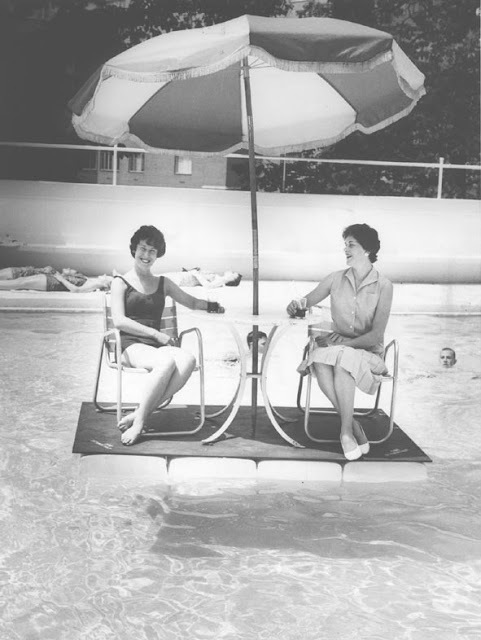 Apparently, Miss Heath had a few pounds on Miss Vermett, as the innovative "floating veranda" seems tipped in her direction. Remember ladies, a floating veranda never lies. Or, perhaps her cocktail was more full. In any event, I would have given a thousand dollars to see a video of these two trying to get on and off that thing! Do you suppose the ladies are still out there somewhere? First African New Church, about 1930. Ever made a cool $1.1 million in a year flipping a property without doing anything to it? The owner of this abandoned church building did in 2002. DCMud blog did a recent update on plans for the building here. The large vacant church structure at 2105-2107 10th Street is significant both for its architectural history, having been designed by well known architect Paul J. Peltz, and for its social history, as a structure and site that has been continually occupied and owned by an African American religious congregation from 1879 to 2002. Its current building has evolved from a major addition and substantial alteration in 1896 to an existing, one story brick building that had been constructed without a building permit sometime between 1887 and 1895. In 1896, it was significantly expanded by its congregation with the addition of a large sanctuary on the third floor and a large corner tower, designed by well-known architect Paul J. Pelz, creating the church building that remains to this date. The adjacent corner lot at 10th and V Streets was the site of a wood frame church for many years prior to the brick one story church building that formed the basis for the structure that remains today. 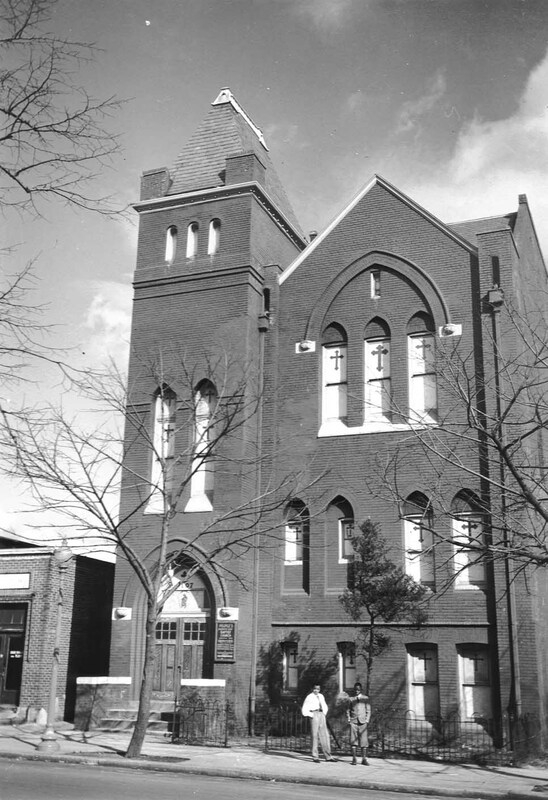 Its origins can be traced to the northwest corner of Vermont and T Streets, in 1878, when the Abyssinian Baptist Church was first listed in the City Directory. At the time, Reverend Henry Bailey was in charge of the small congregation that worshiped there in a one story, frame building. Bailey lived at 1818 Vermont Avenue, and the year later at 1814 Vermont Avenue. 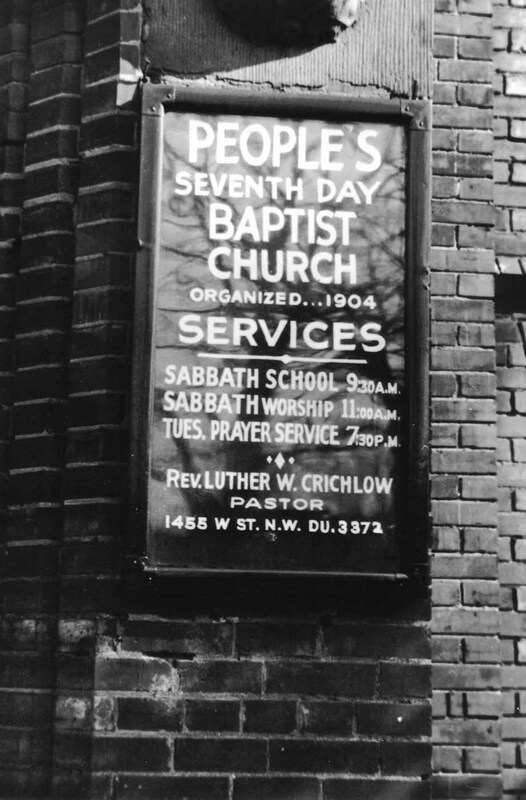 However, on March 14, 1879, the Abyssinian Baptist Church obtained a permit to move their building to the “corner of 10th and V Street, NW.” The cost of this move was estimated at $50. It is assumed that the church moved its church due to the increase of land value at Vermont and T Streets, as several large homes were constructed that year and the year prior across the street, and to gain a larger lot at 10th and V. Early maps show the new location of the frame church resting directly on the corner of 10th and V Streets. 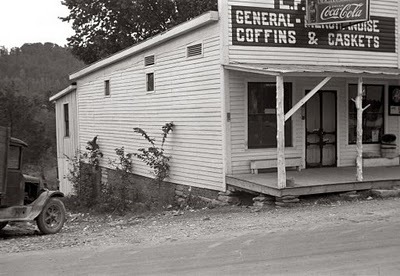 Its congregation stemmed from freed slaves, black Washington residents, and Civil War soldiers and their dependants that had been stationed at nearby Fort Campbell at 6th and Florida Avenue. Along with the move came a name change for the church, and possibly new ownership. 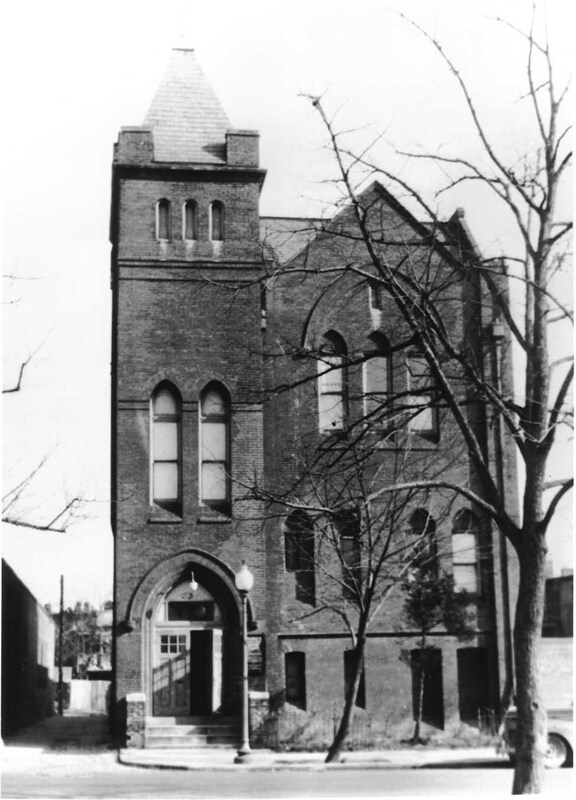 The 1881 City Directory lists the Trinity Methodist Episcopal Church at 10th and V Street, N.W. It was organized in 1880. The pastor in attendance was listed as Reverend Peter C. Louis. Services were held at 11 am and 7:30 pm, with Sunday school at 3 pm. City Directories classify the church as “Methodist Episcopal-Colored.” Trinity would remain at the 10th street address until 1892 when the church was renamed “Zion.” On March 28, 1882, the church obtained a permit to “repair building where damaged by fire.” Washington DC Fire Department records indicate that a fire had occurred on January 30, 1882 that had caused an estimated damage of $250. An 1887 Baist map shows the square-shaped, wood frame building at the corner of 10th and V Street, with a vacant rear yard facing the Union Court alley (where the present day, brick church structure stands today). Sometime between 1887 and 1896, a one story, brick church building was erected at the rear of the lot, apparently without a building permit. It is likely that the older wood frame building was no longer viable for maintenance, and a replacement building constructed at the rear of the lots, facing 10th Street, while the congregation continued to worship in the older structure. 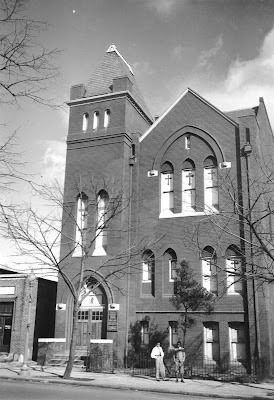 The brick, one story building was mentioned in an expansion permit dated 1896, when the church was significantly added onto to create what is the present day building. The Washington city landscape began to change dramatically after the turn of the twentieth century, as newly built apartment buildings began to replace mansions and estates situated on valuable urban property and large city lots. One such example of this is the razing of the Saunders mansion in the late 1930s that had stood on the prominent northwest corner of Connecticut and Wyoming Avenues since its construction in 1890. The site today is occupied by the art deco styled apartment building at 2100 Connecticut Avenue. 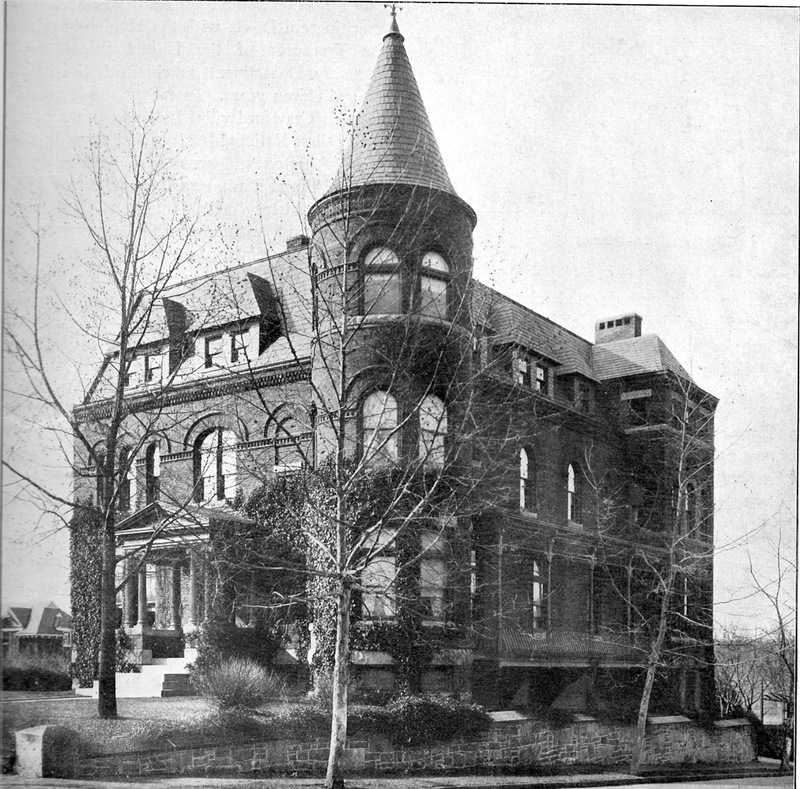 The Saunders mansion faced south onto Wyoming Avenue, with a large corner turret at the intersection of Connecticut Avenue. It was built beginning in June of 1890 to the designs of architect Robert Stead for owner Lorin M. Saunders. 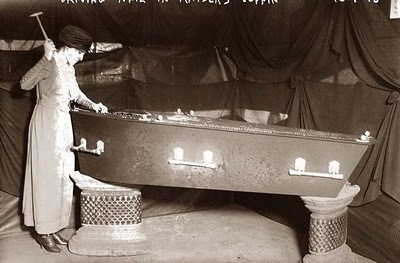 It cost an astonishing $12,000 to construct, and was built measuring 41 feet wide by 63 feet deep. Its address was 2101 Wyoming Avenue. Architect Robert Stead was first listed in the City Directory as a draftsman in 1876. 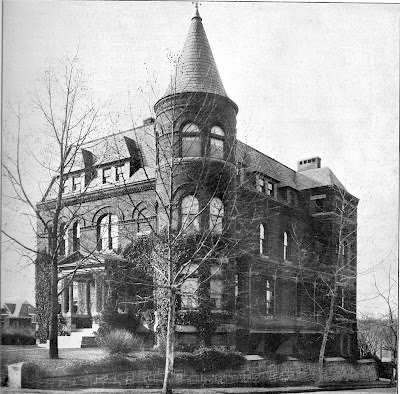 Stead was first listed as an architect in 1883 when he was hired by Susan Okie to design a townhouse at 1714 N Street, NW. He also designed the house at 2026 Hillyer Place, NW in 1887. 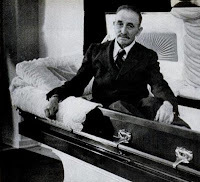 He retired in 1923, and died in Philadelphia twenty years later at the age of 87. Owner Lorin Maxson Saunders made a fortune in his legal practice, real estate development, and in banking. 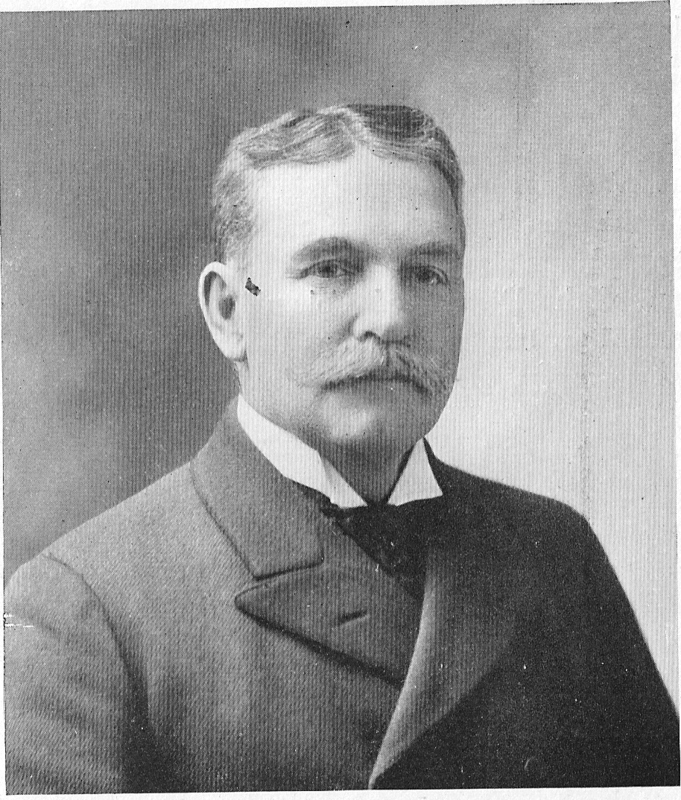 He had been born on November 2, 1840 in Leon, located in western New York’s Cattaraugus County. His parents were William Saunders and the former Parmelia Marsh. After teaching school for a short period, he was known to have left the rural enclave with a mere $30 in his pocket to seek fortune in Washington, DC, obtaining employment at the Treasury Department from 1864 to 1865. Soon after, he obtained his law degree from the Columbian University (The George Washington University today), and retired from government service in 1870. His personal fortune that year was estimated as $5,000 in the federal census. In 1881, Saunders realized that great profits could be realized from real estate development in this city, and he opened a real estate company at the corner of 11th and F Streets, NW (below). This is the story of two really, really close sisters who once owned adjoining and interconnecting houses on Dupont Circle form several decades. 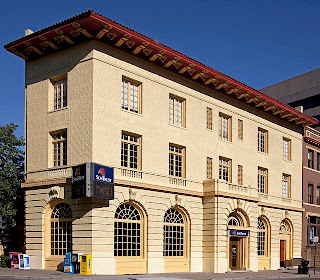 The bright yellow Sun Trust bank building located at the corner of Connecticut Avenue on the south side of Dupont Circle has been providing time and temperature for local commuters for decades. Its recent lavish paint scheme unfortunately covers what was a highly ornamented brick pattern designed into the building when it was built in 1912 (seen below). It replaced one half of an unusual double house originally built on the site in 1880 for two apparently very close sisters. The U. S. Trust Company hired architect Jules Henry De Sibour to design the corner bank building, which began construction in September of 1912. It was built by the F. J. Nesbit Company at an estimated cost of $50,000 and featured a complex design of different colored bricks with granite trim and a clay tile roof. 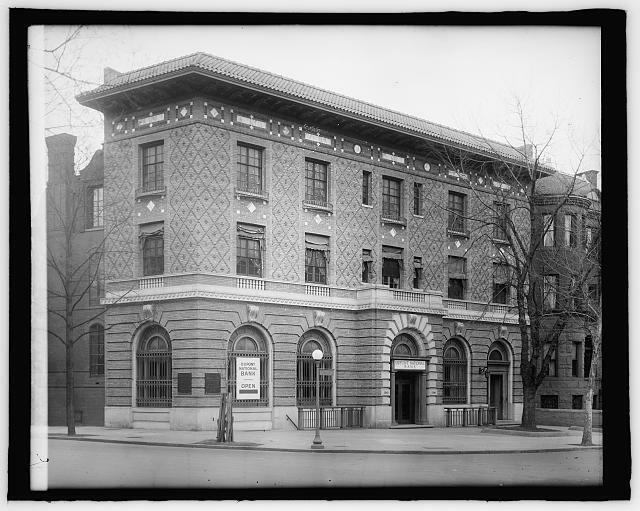 It later became the Dupont National Bank Building, pictured here about 1925, and the Guardian National Bank, along with other institutional names in subsequent years. The pair of adjoining houses previously located on the site, at the intersection of Massachusetts and Connecticut Avenues facing Dupont Circle, had been built beginning in March of 1880. Built for two sisters, Charlotte E. and Katherine Wise, it is unusual in that each of the three levels shared balconies facing Dupont Circle, one on each floor, with each having doors that led to each individual house. The adjoining houses, however, were each built with separate building permits at an estimated cost of $9,000 each. Two years after they were completed, the owners no doubt stood on the balcony to watch the unveiling of the Admiral DuPont statue in the center of the circle on December 10, 1884. This arrangement might have decreased future resale value in today’s market, but it allowed the sisters to interact and pass into each others houses without having to venture outside. The sisters were the daughters of Capt. H. A. and Charlotte Everett Wise. 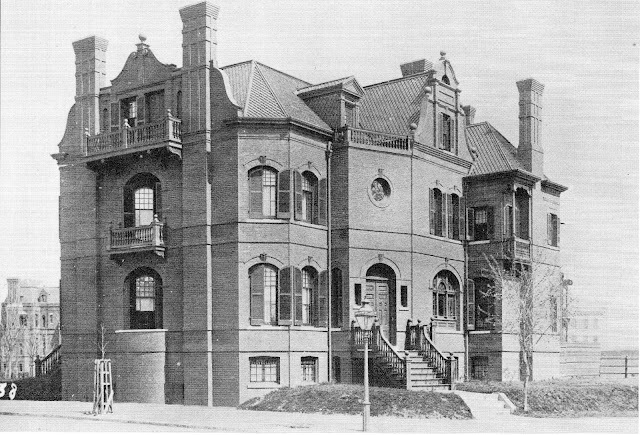 The homes were designed by architect J. Cleveland Cady (1837-1919) of the Cady-Gregory firm in New York. Cady was a student of Henry Hobson Richardson, the leading architect of the post Civil War era in the country, and is perhaps best known for his Metropolitan Opera House design. The houses were built by Robert I. Fleming.